Orkut has been one of the major development areas in recent times. Now orkut has added a couple of new features to its repertoire. It has added a Recommended communities and also a spam folder to the profile. Most of the regular users may have noticed this by now.Orkut nowadays is flooded with spam and a dedicated spam folder is a nice option. 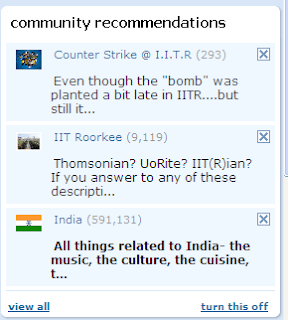 Orkut has added a recommended Communities feature to the orkut home page. You can see it under the friends column. It shows the communities you haven't joined and they have some friends of yourself as their members.So Orkut recommends you to join those communities. This is on the lines of Facebook where you are recommended friends on the basis of mutual friends.This is a pretty nice feature considering you may share your views with some of those communities.You can disable the feature by clicking the Turn this Off link on the bottom of the panel or you can go to the settings and turn Off the recommended Communities. Secondly I have noticed a spam folder link at the home page, which I thought was just for communities. But now there is spam folder for all the profiles , so anything you mark as spam goes in there.The link is visible under the settings link at the left sidebar of the home page.So a lot of development is taking place on orkut which is good for the community and the users.Great Going. Yeah it is true. Form many people I know, all they do on internet is juset come on orkut. Chat for a couple of hours and just Sign out.